Archaeologists in Texas thought they’d made an important discovery in the 1990s, when they unearthed a trove of stone tools dating back 13,000 years, revealing traces of the oldest widespread culture on the continent. But then, years later, they made an even more powerful find in the same place — another layer of artifacts that were older still. About a half-hour north of Austin and a meter deep in water-logged silty clay, researchers have uncovered evidence of human occupation dating back as much as 16,700 years, including fragments of human teeth and more than 90 stone tools. Indeed, an entire generation of anthropologists was taught that Clovis represented the continent’s first inhabitants. 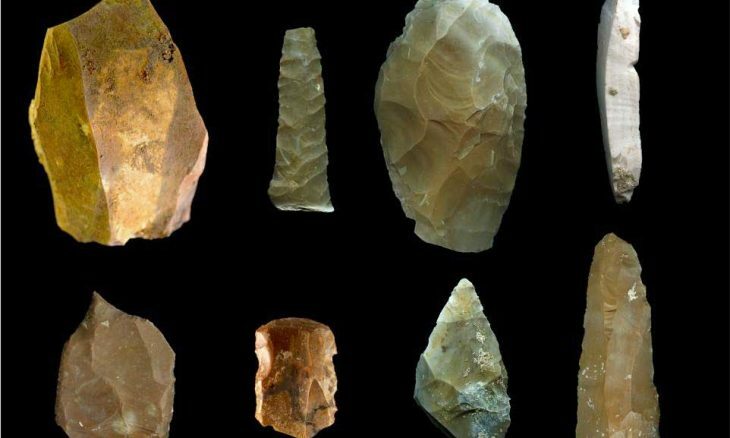 But, along with a handful of other pre-Clovis finds, the Texas tools add to the mounting evidence that humans arrived on the continent longer ago than was once thought, said Dr. D. Clark Wernecke, director of the Gault School of Archaeological Research. “The most important takeaway is that people were in the New World much earlier than we used to believe,” Wernecke said. 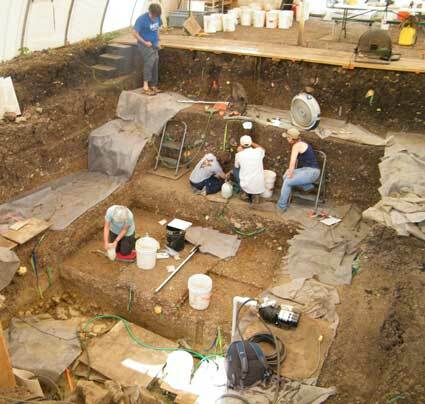 The location in Texas where the new finds were made, known as the Gault site, was first identified in the 1920s, but it wasn’t until the 1990s that archaeologists discovered the first tools, like tapered-oval spear heads, that were clear signs of the ancient Clovis culture. It was those finds that Wernecke and his colleagues went to investigate further, when they began working at the Gault site in 2002. “At the time, we were interested in Clovis, and we had no idea of anything earlier there,” he said. After several years of digging test pits and making chance finds, the team ended up focusing on two of the most striking parts of the site. The first part, known as Area 12, revealed an unusual “pavement” constructed out of cobbles buried deep beneath the surface. “[It’s] a roughly two-by-three-meter rectangular gravel pad about 10 centimeters thick of rounded river gravels in a narrow range of sizes, with artifacts of at least Clovis age on and around it,” Wernecke said. The presence of Clovis-era stone tools suggested that the paved floor dated to about 13,000 years ago. The team kept digging, and about 1 meter below the pavement and the Clovis tools, they found nine more flakes of shaped stone, along with a scattering of animal bones. Assuming that material found below the Clovis pavement must be older than Clovis, the researchers were intrigued. But there was not much to go on. “In Area 12, you have the pavement, lithics and bone, and not much else,” Wernecke said. However, the team also turned its attention to another area nearby, where it discovered significantly more, and larger, artifacts that were also older than Clovis. Here, at a spot named Area 15, the researchers first found a few more stone tools fashioned in the signature Clovis style. But several centimeters below that, an abundance of new material appeared — including human teeth. Among a pile of limestone rocks, the team discovered the enamel caps of four adjacent teeth from a young adult female. No human bones were found, and enamel can’t be radiocarbon dated, Wernecke noted, so details about the woman — like how and when she lived and died — remain a mystery for now. However, within this same, deep, older-than-Clovis layer of sediment, the researchers unearthed yet another compelling find — more than 90 stone tools, fashioned in a style that clearly wasn’t Clovis. But many of the newly found, deeper artifacts didn’t fit that description. “The morphology is completely different,” Wernecke said. “They are not lanceolate points with basal thinning. “Three of them are very small stemmed points, and the fourth is a somewhat thick sort of lanceolate point. In addition to the 90 tools, the artifacts include more than 160,000 stone flakes left over from the tool-making process. 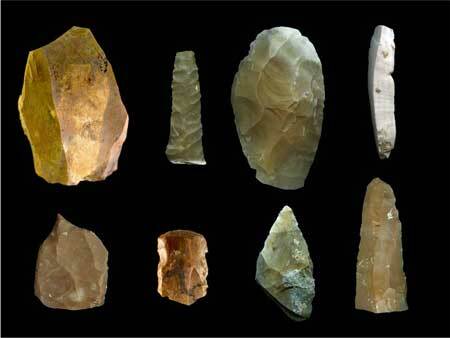 And they, too, are different from the flakes found with Clovis tools, Wernecke said. “The flaking patterns are also completely different,” he said. But the fact that these artifacts were different from, and deeper than, the Clovis points didn’t necessarily prove that they were older. To establish their age, Wernecke and his colleagues submitted 18 of the artifacts to a lab for optically stimulated luminescence dating — a process that analyzes tiny grains in the soils to reveal when they were last exposed to sunlight, thereby giving a sense of how long they’ve been buried. The results showed that the artifacts were between 13,200 to 16,700 years old. At their most ancient, that’s some 3,000 years older than the earliest known signs of Clovis culture anywhere in North America. The discovery of all of these older-than-Clovis artifacts raises tantalizing questions about what that earlier culture was like, and how it compared to the Clovis culture. According to Wernecke, the pre-Clovis tools suggest that their makers were likely direct predecessors of the Clovis. Many aspects of their technology — like how they made biface blades — were similar but not identical, he said. “Blade technology does not seem to have changed a lot — a little bit in technique, but both cultures were making similar blades,” he said. This continuity in technology might indicate a similar continuity of culture, Wernecke added, a gradual transition from one culture to the next. “You would logically expect some similarity,” he said. “If people adopted a new technology, some of the old would hang around. Much more work remains to be done at the Gault site, Wernecke said. “In 1590, [Spanish missionary and naturalist] Jose de Acosta wrote that the people in the New World were primitive humans who must have walked here, and we have built on that premise ever since,” he said. “But it was not possible to walk here until much later, with 3-mile-high glaciers in the way. Moreover, he added, the diversity of artifacts uncovered at the Gault site also shows that the continent’s earliest peoples were not a static or monolithic group. Wernecke and his colleagues presented their findings at the 2015 meeting of the Plains Anthropological Conference. Digging undisturbed deposits definitely allows for accurate dating. That’s why my finds on the washed plains of the South Texas Rio Grande will never be famous. I have tools and points from at least six diferrent cultures. Some are “EXACTLY” like what you just reported. Keep digging, it makes my finds more important every day. I live in putnam county GA.and i have a lot of artifacts that strongly resemble the ones that were found in texas.not just a few i should say.i could try to explane but it seems to do no good.i truly have artifacts found rite in my yard that only compare to the oldest ever found.my pics can be found at G+ just rocks a collection by Robert Firesheets. I have many just like the ones found in texas.the only outher artifacts they compare to are the ones from Africa 70 thousand years ago. Few mistakes have been more durable than the Clovis timeline. My gosh, when are people going to learn and understand Texas is not in the West. At best, it is central south. The middle artifact is almost certainly a flake fragment. The top one looks Early Archaic split stem/ bifurcate, but is fragmentary. The bottom looks generic Late Archaic stemmed. Some have suggested mixing of artifacts into the lower stratigraphy at this site. This nneeds more scrutiny. This material and its provenance has been known for about 20 yearss. Not being in “the business,” I have no idea why it has suddenly been rediscovered. I hope it will not drop down the memory hole again. Ive found, probably 500 lbs. Of worked flint, in SA, its a little over a hundred miles S. Of the , ,site N. Of Austin, my stuff is super old, but I’m a colormatcher and artist so I’ll probably never know who or how old my finds are. Took 10gal. Of artifacts to the Witty Museum in SATX. The assistant currater acted like she didnt know what the pieces were, so i told her. BRuce Shaklford from the antiques road show happen to be there, he told her what things were, her face got red and she kept asking me where I found this stuff, I told her that it really didn’t matter since they were just rocks, I shook hands with Bruce, laughed and loaded my flint and came home. Next time I’ll take 200lbs. And go to IT. 2wks. Later the as s. curator called and asked when I was going to bring more stuff in. Life on earth has evolved over centuries. Just as the earth has. Our knowledge of it is baffling, as if we only existed in a preconceived thought until proven. What your history book says may be incomplete, we need to keep an open mind. It wasn’t long ago that an anthropologist challenged the ‘Clovis Barrier’ only at the risk of his/her career. These amazing finds just go to show that real science will always get to the truth eventually, in spite of the prejudices of the so-called leaders of the scientific community. I wonder if there are any constructions left from so long ago. 60K years ago men go to Australia and they couldn’t have walk there. The idea that men had to walk to the New World has not been tenable for a long time. One larger point is extremely colorful, predominately pastel blue as I recall. No explanation or theory as to it’s origin….Alibates? It’s like nothing else I’ve seen from Area 12. It would seem significant in the scheme of things. Kate you’re so right about open mindedness, We call anthropology and it’s myriad subsets ‘science’ but we all know better. Perception is so powerful. Period of Significance: 1499-1000 AD is how the Buzzard Cave site was described I believe. It would be interesting to see/read some clinical analysis comparisons. Oh my God! 2 meters by 3 meters is 6×9 feet!!! You have discovered the world’s first HDTV! Those three bases could easily be the same style of point in varying condition. The bottom one one with the ears broke off and reworked. The center base close to the original look and so on. And we can’t just assume that they had very strict guidelines about how to make points like say in the classic paleo cultures. This culture is starting to make Clovis resemble Solutrean in the sense of coming from nowhere and then disappearing. Although Clovis did morph into some other point types. But the high technology did eventually disperse. Or the focus on high level stonework.anyway. what about the time between Clovis and the “stemmed point” culture? You need continuity between the two time periods. I wander if any other “stemmed point” have been found any where else. Perhaps the stemmed points were from contaminated data. Just too much missing for the 16,000 year old theory. 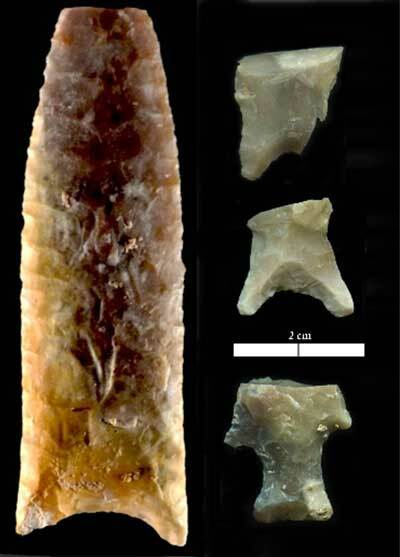 That split base stem fragment in the photo with the Clovis point is very similar to the stem of the archaic Gower Point, of which I have found several in central Texas. Couldn’t differences in tool making technique just be the difference between two people? I have land that is COVERED in Clovis and paleoindian artifacts. Every rock you see has been worked on. I don’t have equipment to dig here. There must be bones or more than just these tools and artifacts. I would like to find a site where I can upload my finds and get info and feedback.. funny thing is my neighbor down the hill can’t find but1 or 2 artifacts. My location up on the hill we have hundreds or thousands. I think I’m on a mound. No doubt.. I have many unique pieces in my collection that I personally found in far Sweeny Texas , including what appears to be a piece of petrified fruit with a thumb print and a bite taken out of it with actual teeth marks visible! All of my collection was found above ground or partially covered . I love it, been knapping for 10 yrs. Finding artifacts for 30. I’m hooked. Grew up in NE Kansas, in the flint hills. Now live 15 miles SE of SA. TX. I have, guessing probably 800 lbs. Of flint & chert in my house!!! Any trace of the 12,000 year old black clay layer, common above the Clovis stratum in the West, that indicates a possible asteroid impact in N. America? We have found a chert spearhead on our property in the north hill country of Texas, Looks exactly like the one found recently at the Gault site. How much effect does gravity have on specimens found in stratigraphic layers? For example a stone item might move lower and faster in the layers than a lighter bone thus disrupting time lines for that layer. The only way a person could be absolutely sure is the artifact and bone be co-joined.